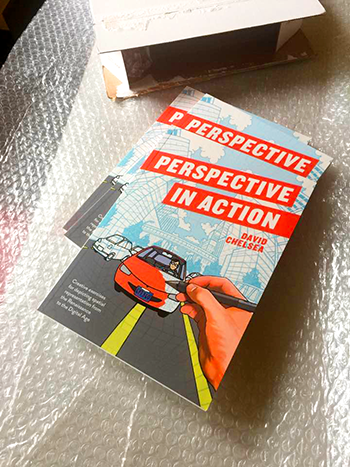 I have mentioned my upcoming book PERSPECTIVE IN ACTION from time to time, but the day of publication has at last arrived (Coincidentally, it is my wife Eves’ birthday. Happy birthday, Eve!) I of course cannot be objective, but I think the book is beautiful– kudos to my editor at Watson-Guptill, Patrick Barb, designers Emily Blevins and Mari Gill, and the entire production team. Continue reading PERSPECTIVE IN ACTION Arrives! 24 Hour Comic Promotion This Saturday At Tonalli’s! 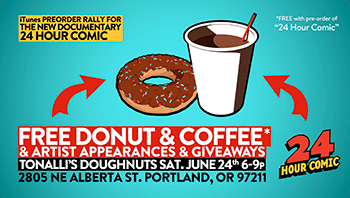 Tonalli’s Donuts & Cream is hosting a rally this Saturday to support the documentary film “24 Hour Comic”. Swing by, meet the artist, filmmakers, get autographs, and get free stuff for pre-ordering the film! 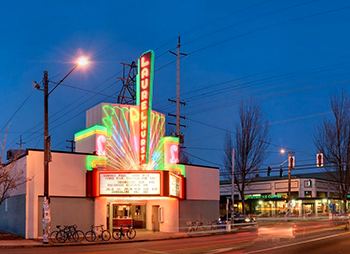 Including FREE DONUTS & COFFEE, plus enter to win your very own PDX CARPET, used from the premier! You won’t want to miss the comic art battle between me and PIZZA GUN’s Jacob Mercy! Continue reading 24 Hour Comic Promotion This Saturday At Tonalli’s! Details are somewhat sketchy as of now; I will add more as they come in. 24 Hour Comic Documentary On iTunes! Milan Erceg’s terrific documentary about a topic close to my heart, 24 Hour Comic, is releasing July 11 on iTunes. The film follows 8 artists as they try to create 24 pages in 24 hours. 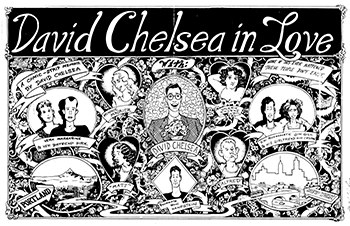 It features me quite prominently, as well as my fellow cartoonists Paul Guinan, Rachel Nabors, Sera Stanton aka Opal Pence, Jacob Mercy, Pete Soloway, and Tom Lechner, and also has some delightful footage of my daughter Rebecca at 13, making her first attempt at a 24. 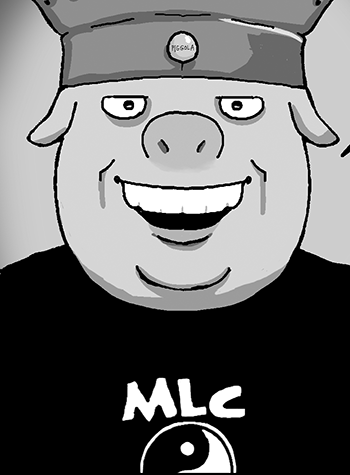 Special guest appearance by comics guru Scott McCloud! This is the debut film from a very gifted filmmaker who happens to be a dear friend. Continue reading 24 Hour Comic Documentary On iTunes! 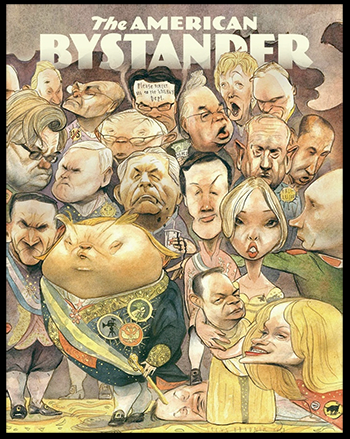 This past weekend, I got my copies of the latest issue of American Bystander in the mail. 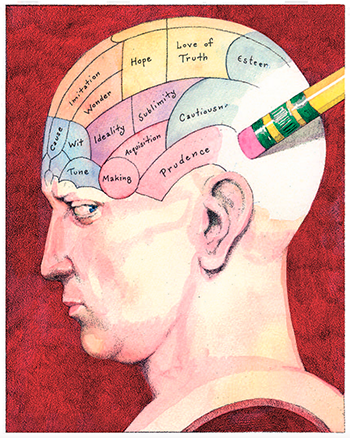 This issue of the recently launched humor magazine has contributions from comics gods Rick Geary, M. K. Brown, Frank Springer, Mimi Pond, Peter Kuper, Howard Cruse, and Shannon Wheeler, illustrations by Ron Barrett, Drew Friedman, and Roz Chast, gag cartoons by S. Gross, George Booth, and the late Jack Ziegler, an interview with Realist magazine founder Jack Krassner, and a beautiful wraparound cover depicting Trump and his court by Steve Brodner. I cannot recommend it highly enough, and that is not just because I happen to have work in it, an illustration for a humor piece by Steve Young about an Uber-like ambulance service. Continue reading American Bystander #4!